created between 30,000 to 70,000 marketing impressions daily. It is sad to see so many professionals who think that all they need to do is paint their name and phone number on the side of their vehicle and people will call. On any given weekday you will see hundreds of white vans with logos cruising down the local highways of the Metro area. One typical example is a professional painter driving a white Ford van. You can tell it’s a painter because he has a logo with a paint roller next to some red lettering with black shadow on an orange background. The colors are bright and attract attention, but the words are difficult to read even when the vehicle was parked. It is impossible to read it at 70mph! He doesn’t know it, but this contractor is missing one of the greatest marketing opportunities that technology has made available to anyone with a company vehicle. Over 30% of respondents to the ATA poll said they have based buying decisions on truck-side ads they have seen while driving. Mobile advertising is the most effective and efficient form of outdoor advertising. Sure, the painter had put his name and logo on the side and back of his van, but it couldn’t be read while he was driving down the highway. What could he have done differently? He could have had his van wrapped! A vehicle wrap is a removable, full-color vinyl graphic or decal that is printed, laminated, and applied directly over the original paint of your vehicle. It effectively turns your company vehicle into a mobile brand awareness billboard which advertises your business while you are driving around town. 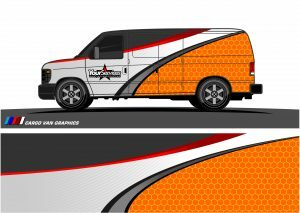 The difference is that the wrap is an eye-popping graphic that uses the entire vehicle to draw attention to your business. Instead of a paint roller logo next to a name on the side of the van, the entire van is covered in hi-def paint cans spilling swirls of bright colors from the roof to form the company name and phone number! The result is attention-grabbing and unforgettable. When compared to other forms of advertising, vehicle wraps are the biggest bang for your advertising dollar. The Outdoor Advertising Association of America shows that fleet vehicle wraps cost just 15-cents per thousand positive marketing impressions (CPM). Compare that to $1.78/CPM for a fixed location billboard, $5.92/CPM for a drive-time radio spot, and $11.51/CPM for a 30-second, non-primetime local TV commercial! The Specialty Graphic Imaging Association is a great place to start for information on wrapping your business vehicle. The process is fairly simple. Your vehicle is evaluated for the condition of the paint and the vehicle topography. Powdery, oxidized paint will not allow the vehicle wrap material to adhere correctly. Compound curves (curves that extend in several directions at once) make the job more labor intensive. Your vehicle is then measured and photographed. The industry has developed standard templates for nearly every vehicle. This step is just to make sure your vehicle doesn’t have any discrepancies. You can either supply your own custom graphic or work with an experienced wrapper to develop your own unique, eye-catching design that lets everyone know who you are, what you do, and how to get in touch with you! The design is placed on the template, so you can see the design before it’s printed. The wrap is printed on digital printers that produced the full-color design in vertical overlapping panels to ensure precise registration of your advertising copy. The vehicle is hand washed, dried, then wiped down with isopropyl alcohol. The wrap is then painstakingly installed. – a process that can take up to 12 hours depending on the complexity of your vehicle’s lines. A full, high-quality wrap using quality Avery or 3M vinyl will run between $3,000 to $5,000. That is a small price to pay for the potential to create a vivid, memorable impression on thousands of potential customers as you drive from one job to the next.